Apart from hearing the Germans saying "...der Englander..." in the night I sleep perfectly well. In actual fact this is the only morning where I need to be up and out and at them and this is the only morning where I could really have done with a lie in! Nature, luck and Murphy's law always seems to be against us. As I scramble and fight my way out of this ridiculous tent for the last time I can see at least the weather is on my side. There's not a cloud in the sky and the bleeding wood pigeon that follows me wherever I go is "wo-wooooo-wo"ing away somewhere. I start to disassemble the tent and pack away. I expect the Germans will all be tucked up in bed and nursing hangovers after last night's drinking session. They're not. One of the ladies approaches me and asks if everything's OK, I tell her quizzically that it's fine. 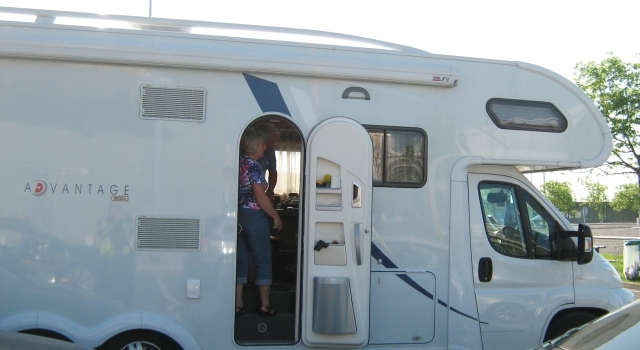 It seems that 2 members of the German group and another camper have been robbed in the night. Someone has slashed the tents open whilst they slept and stolen wallets. My stomach turns. I'm almost packed and I know I'm not missing anything, but I still check my wallet, my phone, my passport and all my paperwork. Oh god! Imagine that, here's me worrying about my stupid phone when I could have been robbed and 3 people have been! Who has the balls to cut a tent open when the occupants are inside, sleeping. To do that when there's 20-30 associates of the occupants all camped nearby. I don't know why I wasn't robbed, I'm camped alone. I wonder if my small annoying little tent might have put them off, maybe I look too poor. With these rather negative thoughts in mind after what has been overall a very positive trip, I set off. I'm far too early but I'd rather be early than late, and there's always the risk I'll get lost yet again. I try to make mental records of what it's like to ride on the wrong side of the road. As I do I notice I'm quite comfortable with it now and wonder if I'll be able to ride on the left when I get back home. I try to embed images of the French countryside into my mind so I'm certain not to forget. I make sure to notice how quiet it is, how little traffic there is and how I feel right now. I feel...I don't know how I feel. The Chunnel signs appear soon enough and without realising it I'm heading into the barriers. My train is not till 1125 and it's only 0930, I'm way too early but I don't mind, I can have some time to visit the loo and grab a drink. Well that's what I thought. The automatic booth swallows my card and promptly tells me off because I'm too early! Cheeky blooming computer. It then offers me a crossing in half an hour which would cost me an additional £41, or I can wait an hour and pay nothing. I choose to wait, I'd planned to wait longer. Just a tip if you're catching the chunnel, don't be too early. I'm not certain but if I'd been any earlier would I have had no choice but to pay the extra fee? I don't know but next time I don't plan to test this. I have to agree with the computer that I've no bombs or pets or explosive gas tanks then it kindly lets me pass. I fix computers for a living, I don't need backtalk from that one. I'm not quite as bewildered as I was when I arrived at the UK side. This time I know to follow the signs for "Grande Bretagne" and I soon find a car park and a shop. I park the bike next to a large campervan and look at it enviously as I hear the occupant's making a nice cup of tea and jam butties. As I'm stood there rolling a smoke another car parks next to me. The window winds down and a sprightly elderly gentleman says "Where do we go from here?" Would it be rude to ask for a brew whilst you're making one? There's 3 people in the car, 2 gentlemen and a lady. Just like me they're early, they've been told off by the computer and now they're confused too. Between us we sort out signposts and what we need to do. They're from the South of England and they've been to Southern France, stopping at a relative's place and like me they're on the way home. We talk of driving on the wrong side of the road, French speed limits and the changeable weather we've had this week. What must be quarter of an hour passes in moments and looking at my clock it's time to head off for the Chunnel. The English travelers. I don't notice at first, then I'm amazed to hear English without a foreign accent. I'm directed by signs and staff to the front of a queue. Along with me there's another motorcyclist, a young Frenchman on a Bandit 650. Of course he speaks English and he's traveling to the TT races with 2 other friends who are in a car somewhere else in the other queues. He's excited but also nervous, this his first time in the UK and he's already quite a long way from home. Before we can talk any more we're directed down ever more lanes and ramps, and finally onto the Chunnel train. 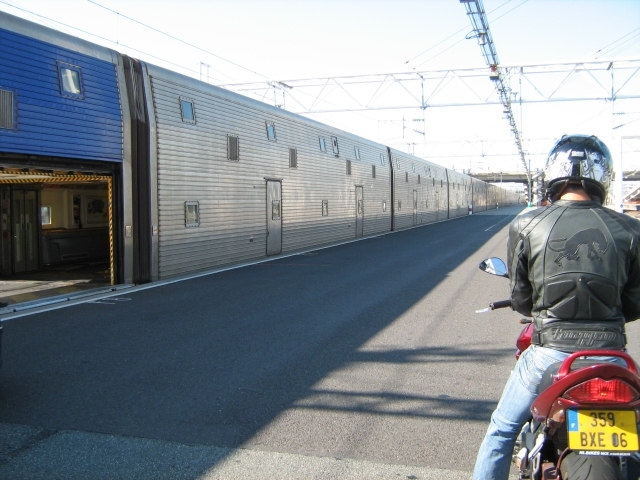 The French biker waiting to board the Channel Tunnel train. We're both waved onto the train together so we end up parked together. 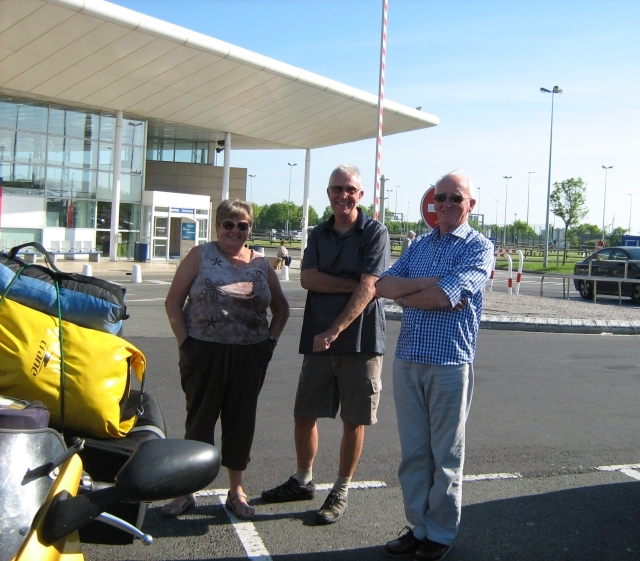 We spend the trip talking of UK roads versus French roads, UK licence laws and French laws, UK bikes and French bikes. He struggles with the odd English word otherwise his mastery of English is complete and I promise myself I really must try harder with my French. The trip passes and I wave goodbye to the French rider as I leave the terminal This time I head to the left and spot the signs for Hastings, I'll follow the coast to my Dad's house. I know I'm back in the UK. It's not the weather, it's hot here too. It's not the road signs or the familair shops that tell me I'm back home. It's not the change of architecture or distinctive British billboards. It's the traffic. Thick, heavy, slow, gloopy traffic. Good lord, I forget just how cramped this country is.